Based on our original, albeit loose, plan for our trip, we should be somewhere on the coast of Central/Southern Chile by now, well on our way to Patagonia, camping on a beach somewhere. Instead, we’re still waiting for our van to arrive and so we’ve made our way to Rio de Janeiro. Not a bad backup plan. Our flight from Foz do Iguazu was delayed slightly, which was actually pleasant because a group of musicians (umm… a Chorinho? Stephie? ), who were also waiting for their flight, spent the time playing some amazing tunes for everyone waiting in the tiny terminal. 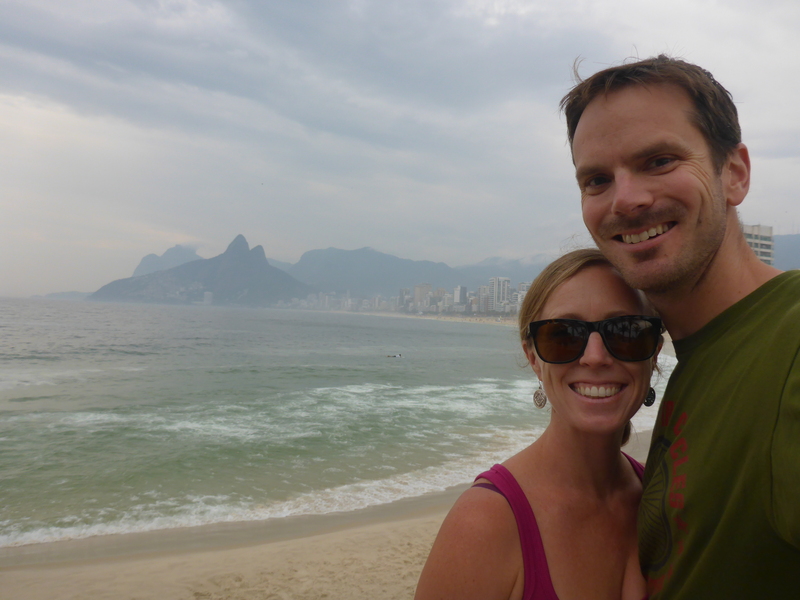 The prior evening we attempted to book an apartment via Airbnb for our stay in Rio. Our first request didn’t work out so we found ourselves trying again the morning of our flight, and landing in Rio before we knew where we would end up sleeping that night. After a bit of battling with the frustrating Rio airport Wifi, we eventually received a message from our host, in a delightful Portuguese/English hybrid, with instructions about where to go. 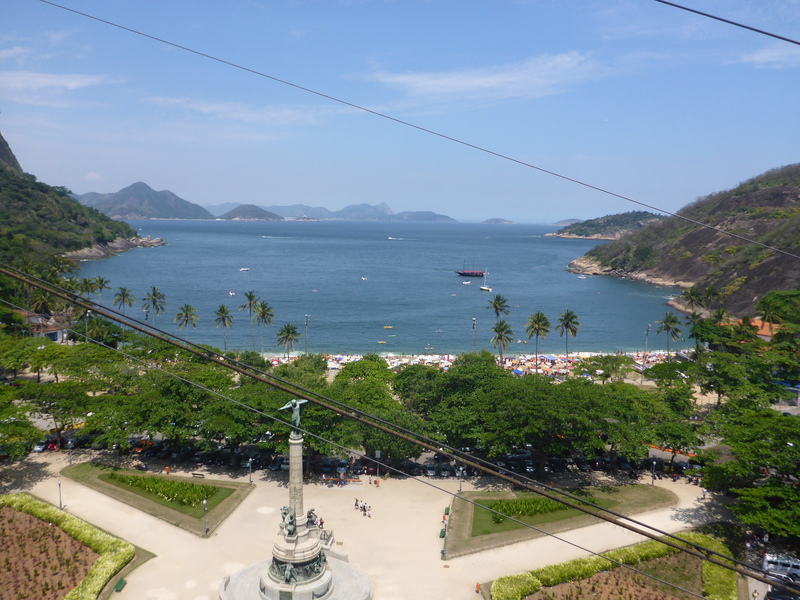 We attempted to negotiate with a couple of taxis on a rate and then were off on our way to Copacabana beach. Driving through Rio during rush hour was a fun reminder of my old commute and arriving at Copacabana was somewhat overwhelming… The apartment building where we’d booked was called The Ritz. Lest you be misled by the name, I can assure you that it was not the Ritz. Smack-dab in the middle of the Copacabana neighborhood, the lower level was a little commercial court with a per-kilo buffet (we’re learning these are pretty popular), a barber, a few shoe/clothing stores… really everything a girl could need. 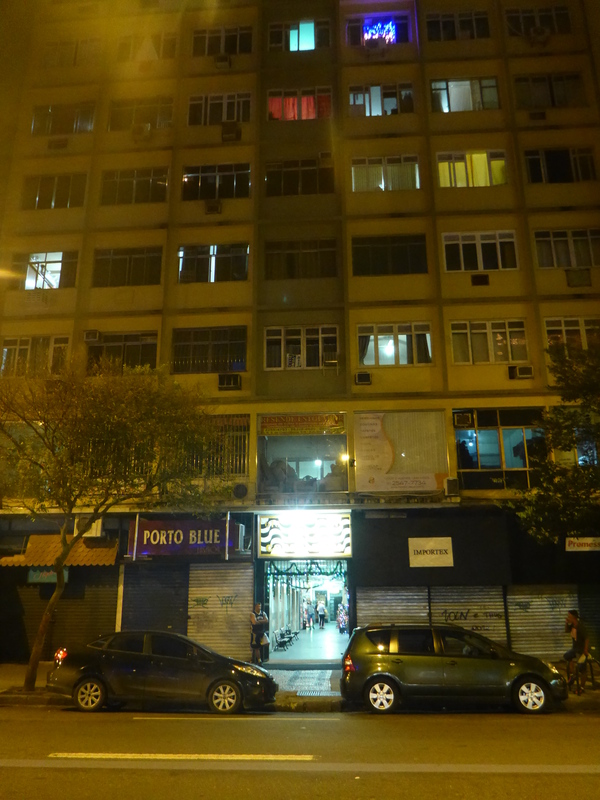 The Airbnb ad had advertised 24 hour security and a doorman… To be fair, I guess there was a front desk of sorts, but compared most apartment building in Rio which featured 10 foot burglar-prevention gates and one or two uniformed security personnel, we felt a bit misled that our version of security was a dude in a black tshirt who sort of hung out between the buffet restaurant and our elevator sometimes. Our host’s message had led us to believe that she would meet us at the building to give us a key and show us inside. When we arrived and attempted talking to the guy working at our front desk about what we were doing – mostly using our apartment number and the name of our host over and over again – we mostly received a blank stare in return. Finally, a woman showed up, said something to the guard, and motioned for us to follow her, up the elevator to the 6th floor and into our apartment. She pulled out a phone and made a call and put Wolf on first with our host, who didn’t speak English, then with an unidentified dude whose main instructions were that when we leave, we should lock up and throw the key underneath the door. And that was it. The unidentified lady said goodbye and left us in the apartment with the key. All a bit odd… My initial reaction to the place was not so nice – I wasn’t impressed and felt misled by the ad for the studio apartment which was definitely in need of a bit of cleaning and TLC. We certainly were not living the lap of luxury, but it was cheap and basic and met our immediate needs. Taking advantage of what was left of the evening, we walked to Copacabana beach – one huge benefit of our apartment was the location, two blocks from the beach. 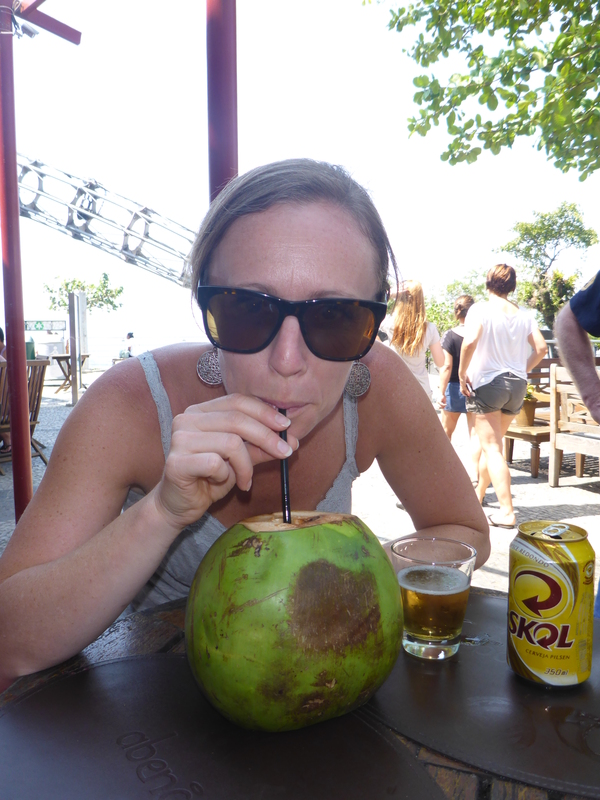 We wandered along Copacabana, stopping to grab drinks, and then to watch an impressive game of soccer-volleyball – getting the ball over the net involves serious soccer skills with head and feet – and enjoyed some excellent people watching. Wolf told a few tales of his last trip to Rio and we strolled along the beach in search of food. We’ve found that hunting for vegetarian-friendly fare can be a challenge unless you want to eat cheese empanadas for every meal. This evening was no exception, and by this point we were in the danger zone – the point where hunger turns to anger and becomes “hanger”. Eventually we gave in and stopped into a grocery store, stocked up on sandwich supplies, and headed home for sandwiches and watching Back to the Future on Netflix. 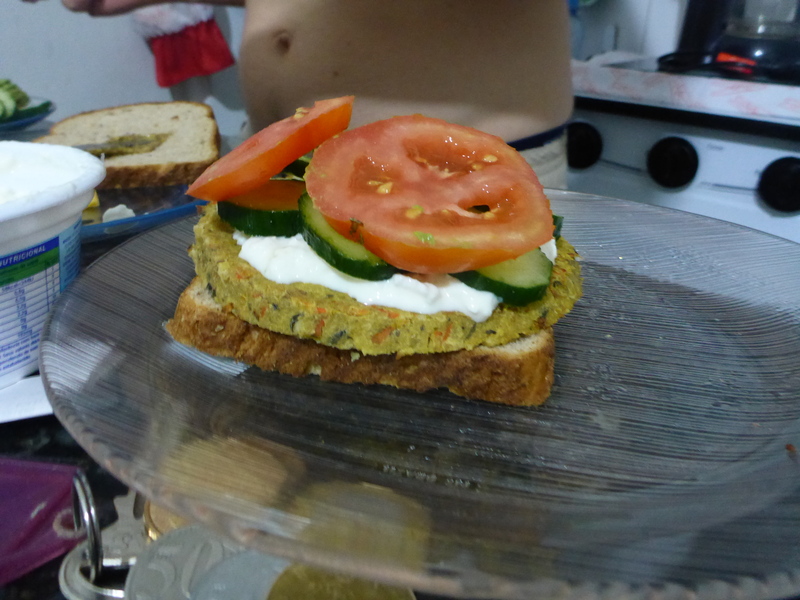 I had to document a classic Wolf sandwich, inspired by his constant hunt for protein: an “Incan” veggie burger, smothered in cottage cheese. Some version of this is on the menu for us almost every day – either for lunch or dinner, and sometimes both. After cereal in the apartment on Saturday morning we set out on the tourist circuit. 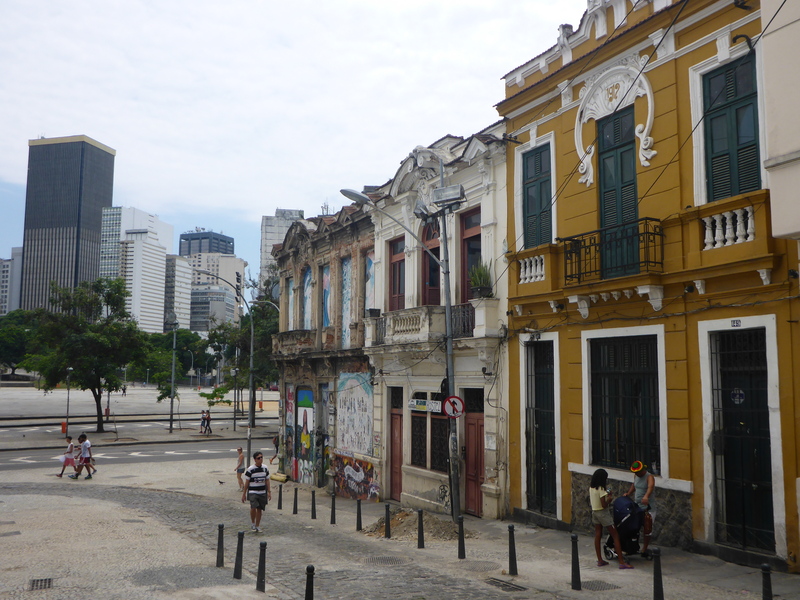 Our intent was to head to the Santa Teresa neighborhood to wander around and perhaps get lunch. After a few false starts trying to figure out how to feed our metro tickets into the machine, we made it onto the subway headed in the right direction. I have to admit that I anticipated feeling unsafe and nervous in Rio, based solely on stories from others and my preconceived notions about crime and danger in the city. 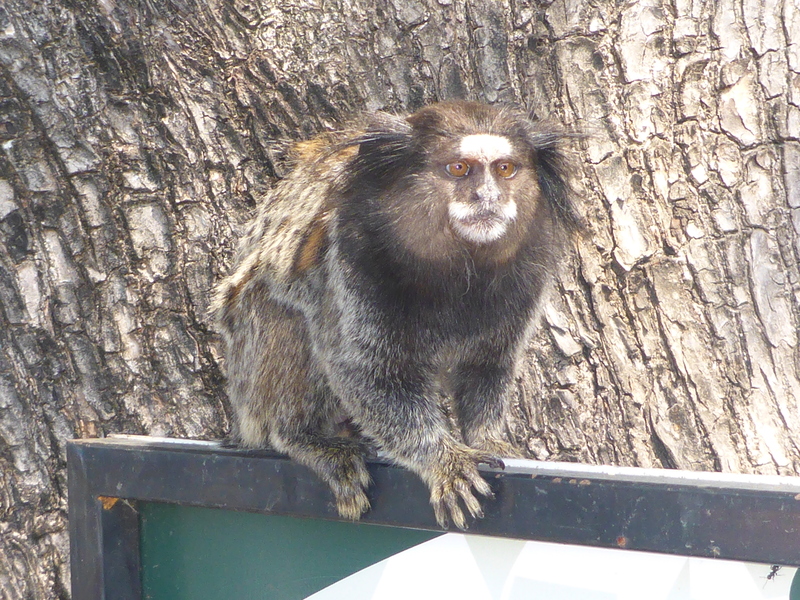 Now, in hindsight, I can say that I didn’t feel unsafe at any time during our stay in Rio. I read quite a bit about the pushes to improve safety leading up the World Cup last summer, and maybe that’s paid off. Or maybe we just played it pretty safe. Or maybe Rio is a bit safer than its reputation. In any event, I’ve heard plenty of horror stories about crime and muggings and violence and was thankful that we didn’t experience anything close to danger during our stay. Emerging from the subway we were immediately sweating. Hot and sweaty, we started searching for the bus that would take us up into the hills. I’m pretty sure we saw every other bus in Rio except the one we wanted as we wandered around and around the subway station in the Lapa neighborhood, dreaming of ice water and ice cream and… really anything ice-related. 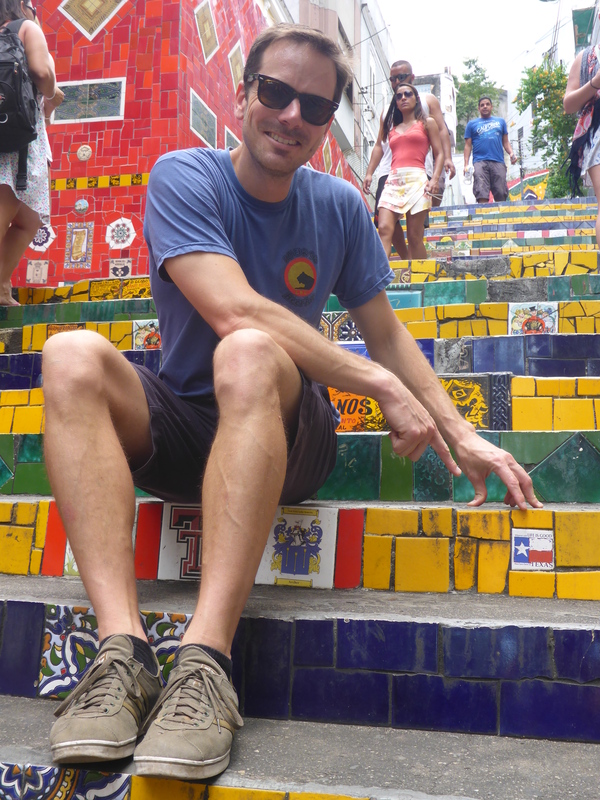 Eventually, we gave up and instead walked to the Escadaria Selaron, a series of stairs covered in colorful tiles from around the world – Wolf even found a University of Texas tile. Although the view was well worth the visit, the heat and humidity were getting to us. 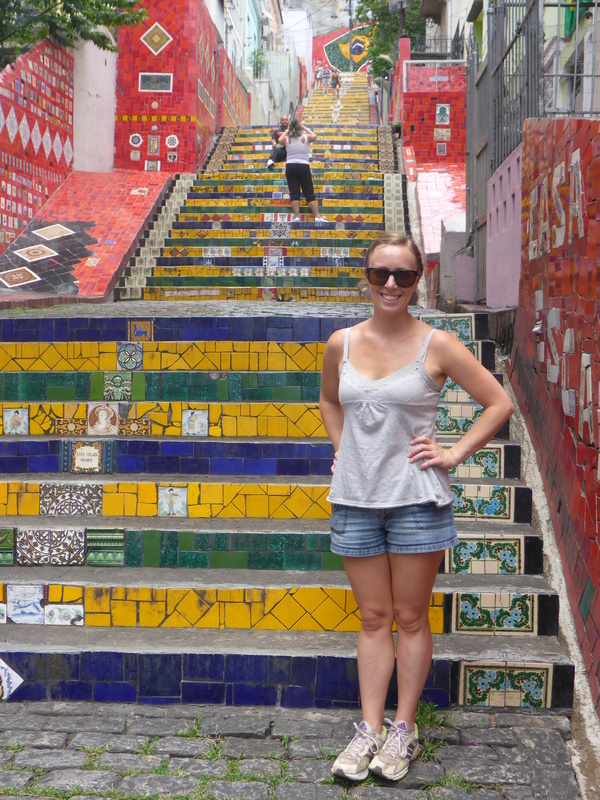 After climbing the stairs, we found our next bus to Pao de Acucar. We must have been on the same schedule as every other tourist in town, because we arrived to a massive line also waiting to take the gondolas up to Sugarloaf. I’m super fun to hang out with when my personal thermometer is not at the ideal level, so I imagine this may have been Wolf’s low point of the trip so far. Waiting in line, in the sun, for an hour… not a lot of fun. The saving grace was the ice cream guy – the man could have charged 50 bucks for an ice cream and I would have gladly paid it. Finally we made it into the gondola heading up Sugarloaf. At the first stop – the first lump of sugar? 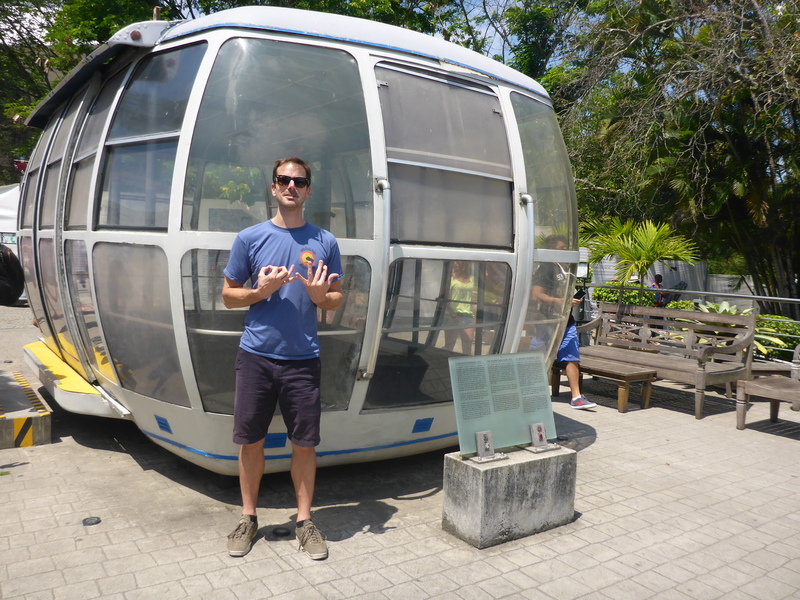 – Wolf was excited to see a view of the domestic airport, as well as one of the classic gondolas on display, both of which were prominently featured in the Bond film “Moonraker”. I had to admit that I haven’t seen the movie. Once he’d recovered from shock, Wolf made a mental note to download the movie later that evening in order to remedy my deficiency. He threw up his best “007” signs for the photo-op. We found a shady place to grab lunch and sip water out of coconuts while we watching cute little squirrel-sized monkeys racing up and down trees and entertaining tourists. From a distance they looked adorable and fun but up close it seemed a bit like they might want to claw my face off. 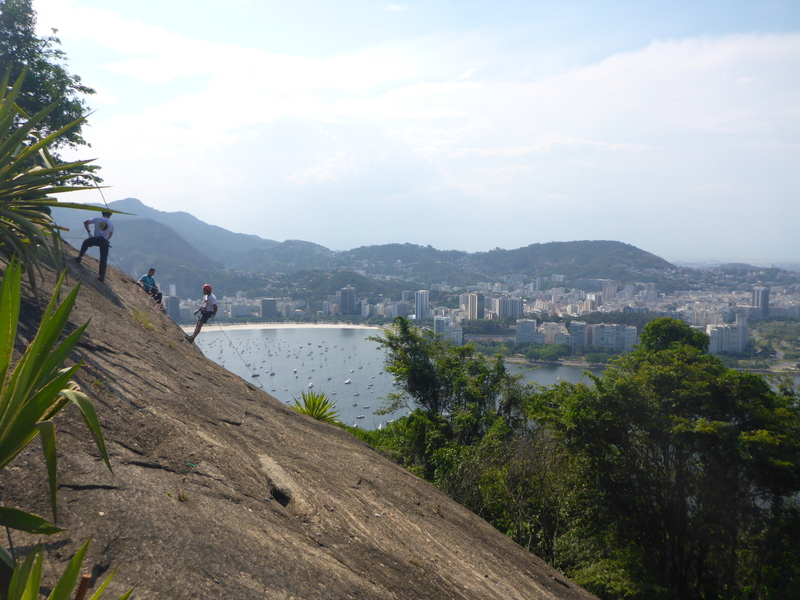 We watched a few people scaling the side of the rock face and then jumped back in the gondolas for the ride to the second peak. The view of Rio from above really does impress. There are so many great cities, and all for so many good reasons. 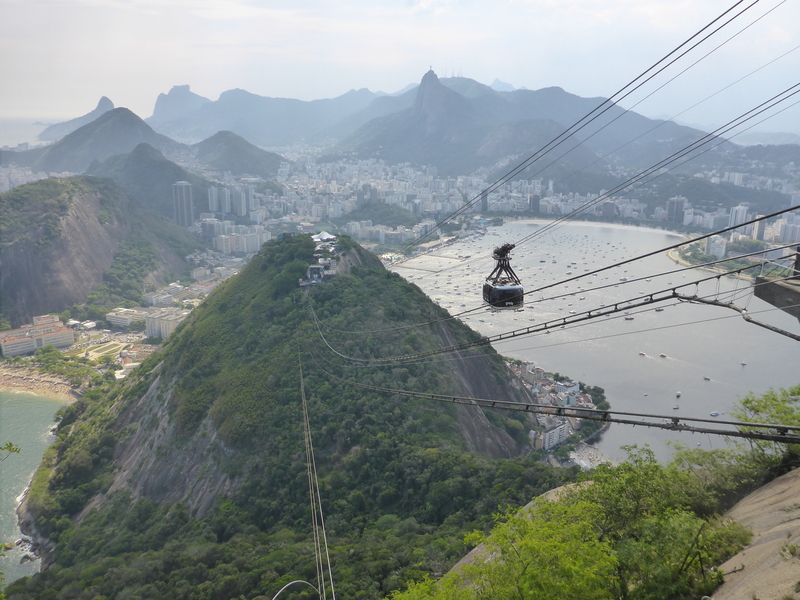 But Rio may just take the cake in terms of dramatic landscapes. Rio somehow manages to feature amazing bays, lined with beautiful beaches, and the gaps between are crammed with jarring peaks and valleys, each with favelas meandering up every available hillside… I think seeing the city from above made me realize what I really liked about Rio, particularly now as I’m comparing it to Santiago. 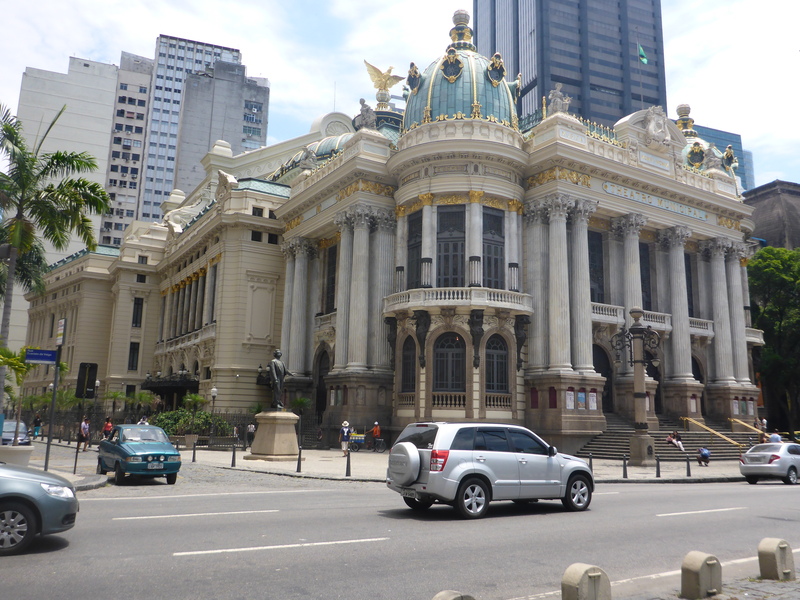 We like Santiago a lot; it seemed very live-able with a ton of great attributes, history, culture, etc. But it also seemed a bit predictable. Rio, even just taking it in from above, is anything but predictable. It is complex – certainly in terms of the landscape, but also in terms of the people and the culture, and the freedom and adaptation and blending that seems natural here. And I like that. We made our way back down, soaking in the views at each step. At the bottom we wandered to the nearest beach, which seemed to us like much more of a local hangout than Copacabana or Ipanema. 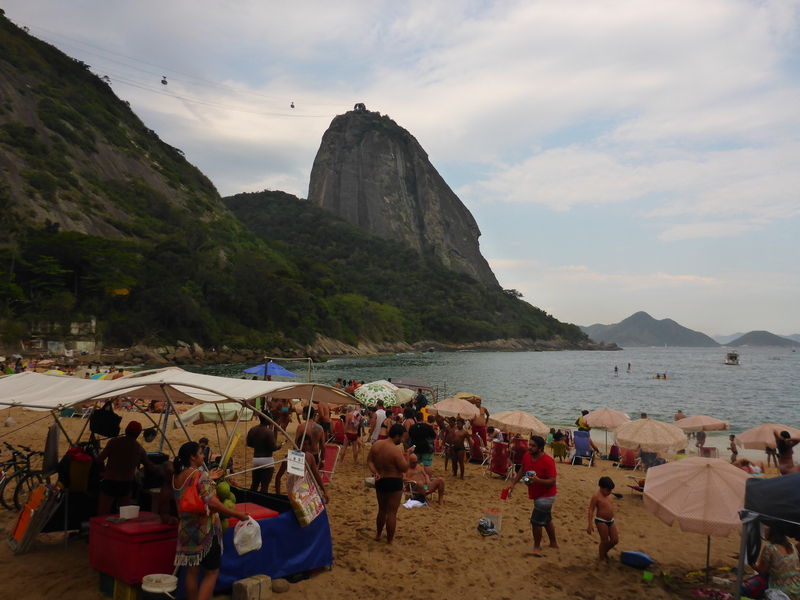 I think I could sit and people-watch every day in Rio and never get bored; this beach was no exception, as it seemed to include every walk of life, anything goes, families, young people… a nice slice of everything. We had a beer and enjoyed the cool breeze and the sun starting to fade before eventually finding a bus back to the apartment. We were more than eager for showers after a day that had been hot, and long, and sweaty. Wolf finished his shower feeling refreshed and renewed and I jumped in, SO excited to cool off. And then, just as I had covered myself in soap and shampoo from head to toe, ready to rinse off… the water shut off. Thinking maybe this was normal I waited patiently, turning the knob on and off. Hmm. I’ve learned that often in Brazil, the hot water heater is actually sort of in the shower head – you choose one of three settings – cold, warm, or hot, and hope for the best — so I fumbled with the shower head thinking maybe it was the issue… still nothing. Finally I called Wolf in, assuming the he’d experienced the same thing and wondering how he fixed it… Apparently he hadn’t. He tried the sink and nothing came out. You can imagine how excited I was to be covered in soap from head to toe at that moment. Wolf rescued this upset, soapy girl by proceeding to pour jugs of drinking water over my head until I was able to rinse off. And he tolerated my grumblings throughout – he really is the greatest. When we let our host know what was happening, she told us it was something to do with the river that supplies the city’s water… We weren’t sure what to make of it all so we set out to find dinner, hoping everything would be fixed by the time we were back. We ended up at a great little restaurant which served up big bowls of pasta, with bonus live music supplied by the guys sitting at the bar next door who had brought out their guitars and tamborines and harmonicas, resulting in an awesome jam session as the soundtrack for our dinner. Sunday morning we were ecstatic to see the water working again. 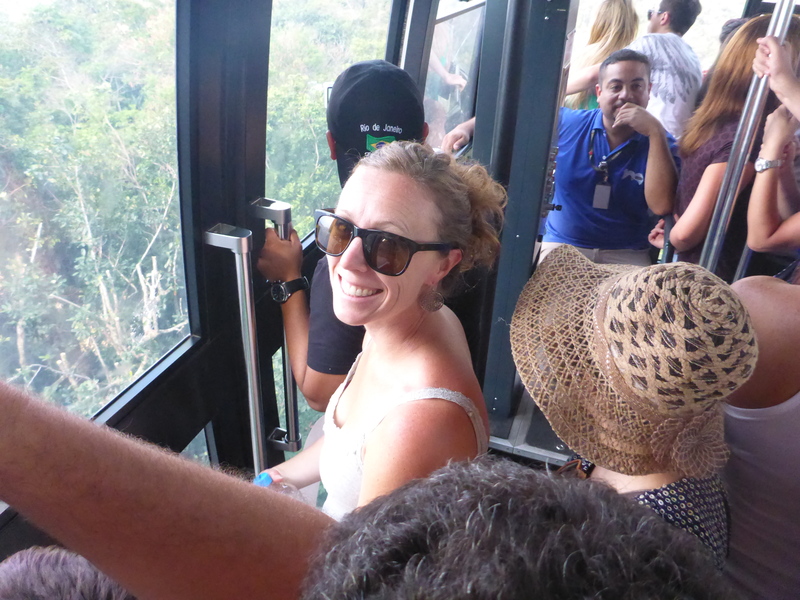 Our plan was to take the train up the mountain to see Christ the Redeemer. After a coffee and thorough exploration of the train/funicular station and surrounding area while waiting our turn, we piled in, ready to soak in another beautiful day and another beautiful view of Rio. About halfway up the mountain we realized it might be a different experience this time around. Our sunny sky turned dark and all of a sudden the rain began. At the top, it was a mad dash to the safety of any overhang. We waited until the rain let up enough that we could dash up the last few stairs to the base of the statue. 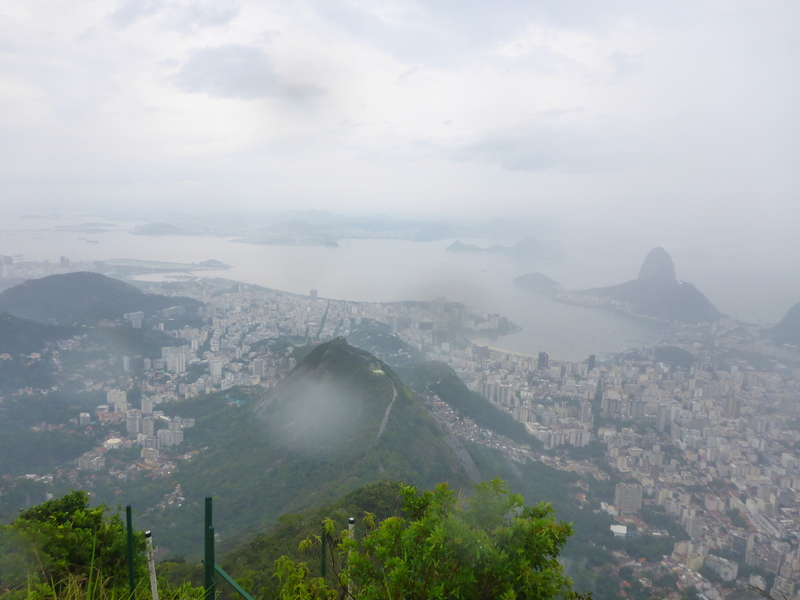 I certainly did a bit of grumbling as I stood in the rain in my shorts and tank top, but even though we were mostly fogged in, I was excited to be there and enjoyed a few minutes of drizzle looking over the city, accompanied by the requisite Cristo Redentor picture. We took the bus back to Ipanema and jumped off to wander through the Sunday craft fair full of paintings and bracelets and really any sort of souvenir one might desire. Wolf spotted a Mexican restaurant, where we stopped for some pretty decent burritos and horchata. Yum. 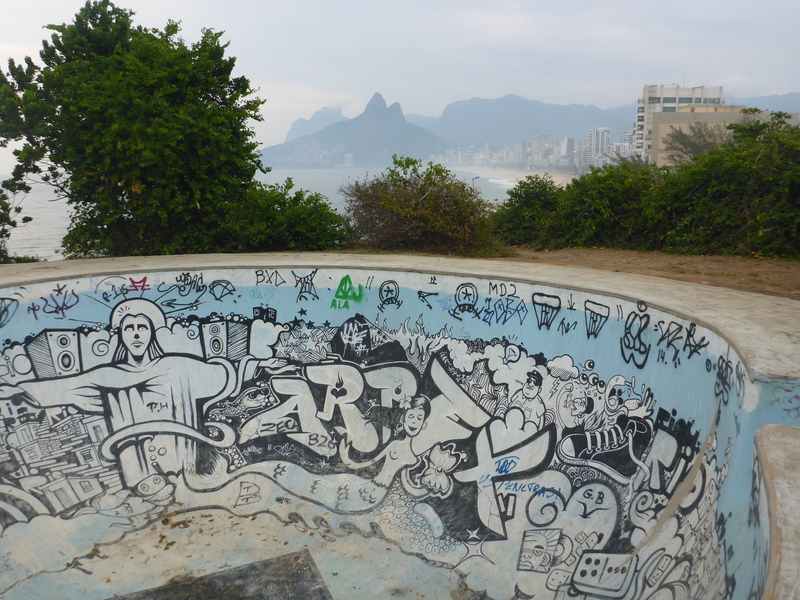 Feeling better, we walked along Ipanema beach and then up through a big park separating Ipanema and Copacabana, stopping to enjoy the view from an impressive skate park. 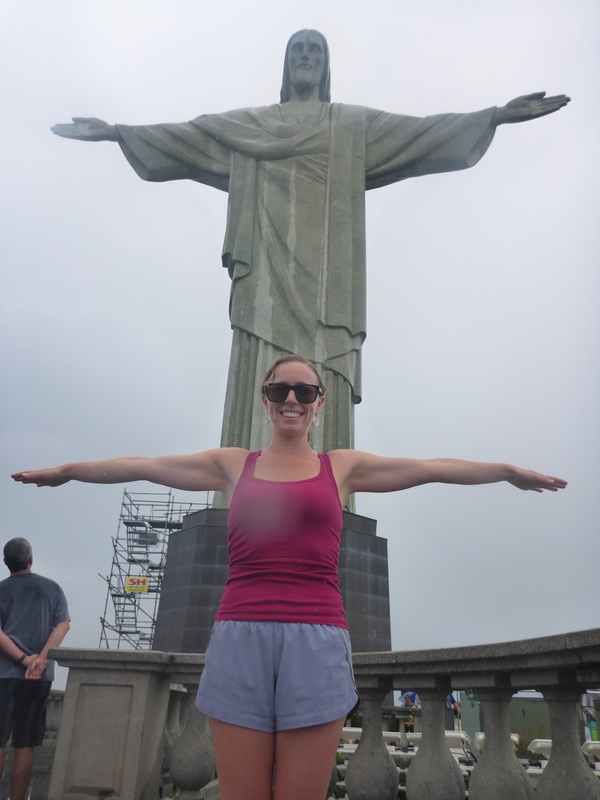 Next Next post: … Rio again!